For Northwestern to beat No. 3 Wisconsin, everything needed to go right. Almost everything did. But that wasn’t enough. The Wildcats (8-20, 1-15 Big Ten) fell to the Badgers (22-3, 14-2) in a heartbreaker, 25-27, 18-25, 25-21, 25-22, 15-11. NU came in having lost 14 of 15, while Wisconsin was riding a six-game win streak. The Cats jumped on the Badgers from the get-go, hanging with them throughout the first set. After each team had a chance at a potential set point, NU took a 26-25 lead, and junior middle blocker Gabrielle Hazen blasted a ball off the face of freshman defensive specialist M.E. Dodge to give the Cats the first set. 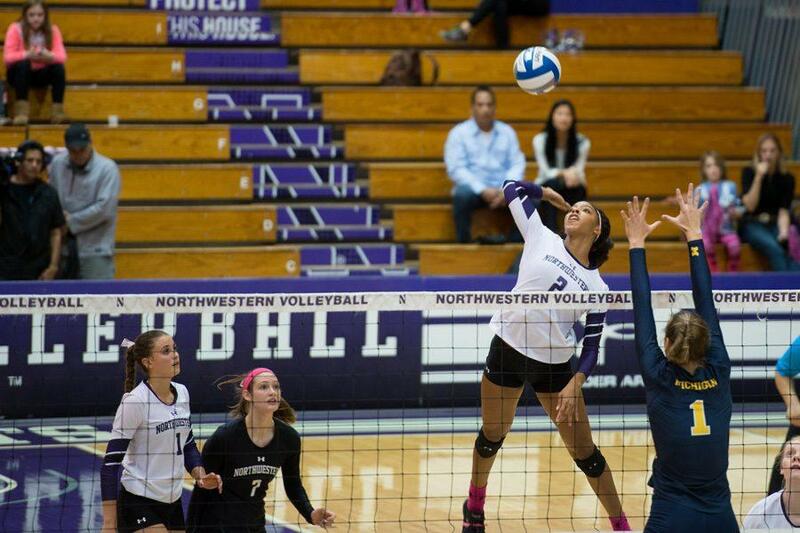 NU carried that momentum into the second set, overpowering the Badgers to a 25-18 win. But Wisconsin came out firing from the third set onward, fighting back and making the Cats pay for their 17 service errors in the match. After winning two close sets to force a decisive fifth set, the Badgers jumped out to an 8-4 lead and never looked back, eventually winning 15-11. Slater said even after the loss, the attitude in the locker room was upbeat. There were bright spots for NU in defeat. Coach Shane Davis said Abbott, who had a career-high 26 kills on a ridiculous career-high 72 attempts, was “the best player in the gym.” Hazen had a .529 hitting percentage, junior setter Taylor Tashima had a career-high 61 assists and freshman libero Sarah Johnson had a career-high 29 digs. Abbott said this was the first time the Cats really changed against a top Big Ten team. NU had a quick turnaround, taking on No. 2 Minnesota (21-4, 13-3) on Sunday night. The Cats looked tired and were overwhelmed by the Golden Gophers, 25-14, 25-13, 25-10. Abbott wasn’t nearly effective, finishing with just nine kills and a -.053 hitting percentage. Senior outside hitter Sarah Wilhite led the way for Minnesota with a game-high 12 kills. The Golden Gophers hit a whopping .475 on the night to NU’s .097. Although the loss to Minnesota was forgettable, the near-miss against Wisconsin was not. Davis said he was proud of the way his team executed the gameplan on Saturday, despite the tough defeat.